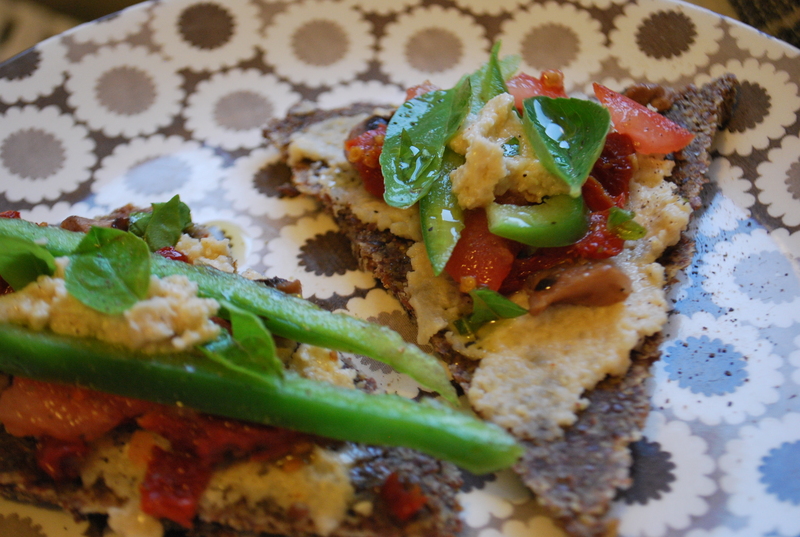 Of course it was amazing, the recipe came from a hot primary-school teacher I met at a potluck. The only way it could have tasted better was if she was a librarian. So here’s the thing, she didn’t give me quantities, so I’ve helped out where I can but you may have to fill in the gaps. Hers was originally made with polenta. Use that (if you have it), otherwise bread-crumbs and cornflour worked fine. Of course hers looked better but mine tasted just as good. 11 years meat-free and I never liked TVP before now. Soak TVP in boiling water. Flavour the water with soy sauce, so that the soy sauce soaks into the TVP as it expands. Meanwhile fry garlic, onion, and fresh, chopped tomatoes. Add tomato paste, tinned tomatoes and chilli if you like. Add the fully softened (drained) TVP to this mixture and heat through. Massage oil into sliced eggplant. 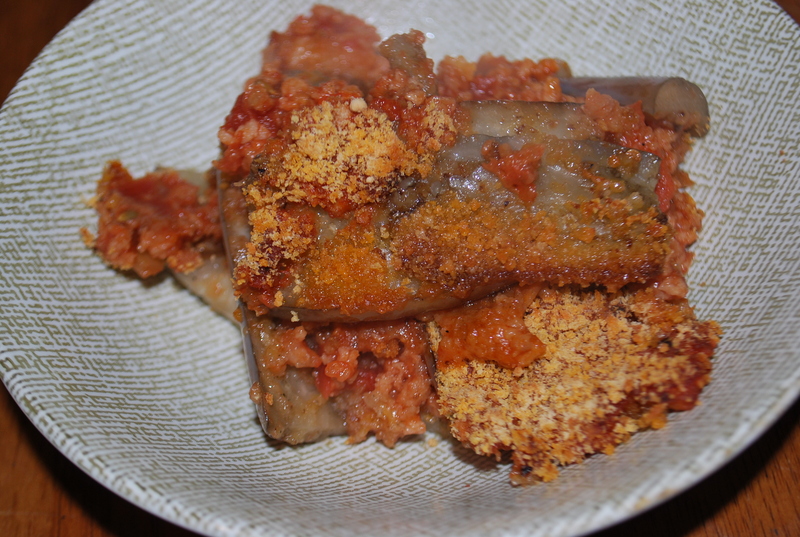 Coat in polenta (or a blend of cornflour and bread-crumbs). Shallow fry the eggplant. This can get a bit messy when polenta falls off but don’t panic. You might need a bit of oil – as the eggplant absorbs a bit – but don’t overdo it. The eggplant should have lost it’s white appearance but not have become soggy. Layer the dish. 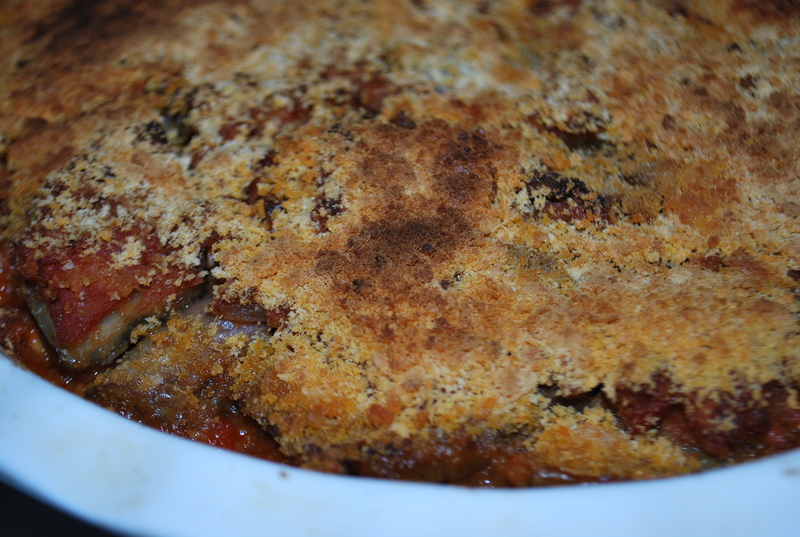 First lay down the tomato mixture, sprinkle extra bread-crumbs atop, create a layer using eggplant, then repeat. Top off with bread-crumbs and an healthy coating of vegan parmesan. Bake till golden. Get laid. PLEASE NOTE: You can buy TVP at most health stores or most Asian supermarkets. It’s pretty widely available, some supermarkets even stock it. This is simple and nice. 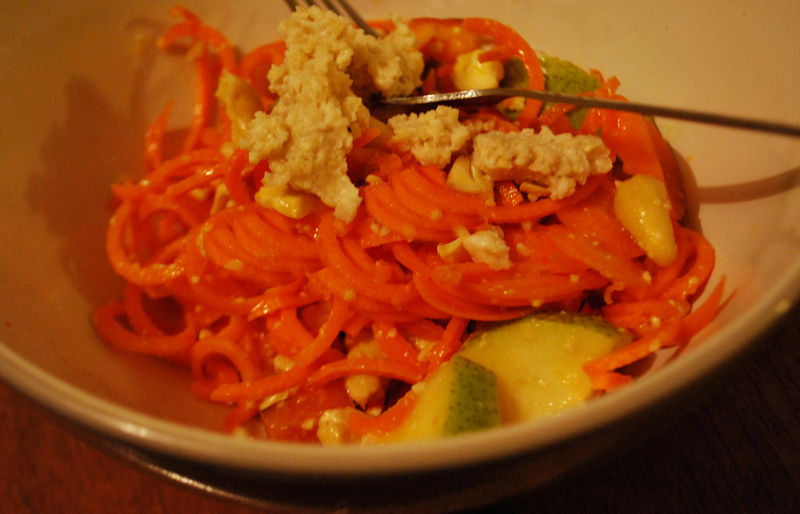 I spiralised up some carrot noodles with my trusty Betti Bossi (you can also just grate or finely chop carrot if preferred), tossed through cashew cheese, chopped pear, and a few whole cashews, then drizzled some lemon juice and a lil’ olive oil on top. It would also be nice with some avocado, if you have any. 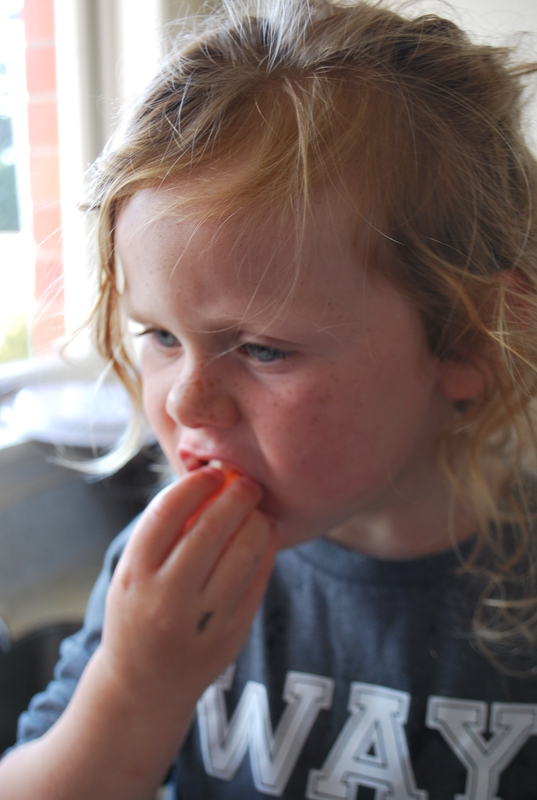 … that actually tastes like pizza. Thanks goes out to Haley and Kathrine for inspiring this! Mix LSA with water until pliable and doughy. 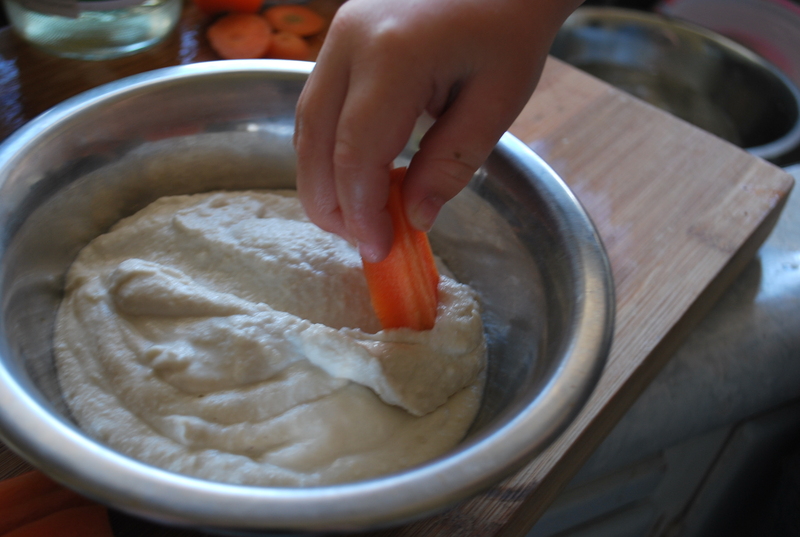 Press into pizza shapes and dehydrate until you like the texture – flip once during dehydration. I like mine a lil’ crispy. To make the cheese, pulse cashews in a food processor until they form a light flour, add lemon, salt and a pinch of miso to taste, then, once you achieve the desired cheesy flavour, add a dash of water – if required – to make it spreadable. Marinate mushroom pieces in water, soy sauce and a dash of liquid smoke. 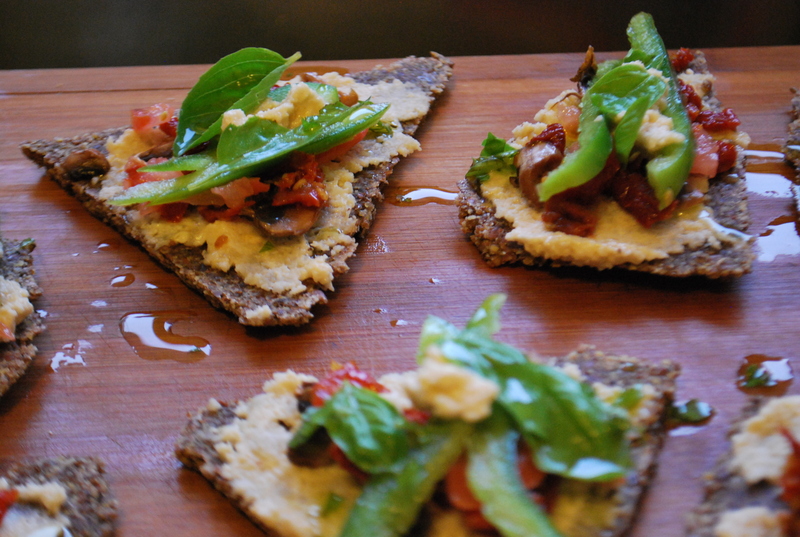 Once base has dehydrated – around 2 hours in our old machine – top by spreading the cheese atop, sprinkle on drained mushrooms, finely chopped tomato, capsicum, sundried tomatoes, and basil leaves. Crush basil and blend with olive oil, drizzle this over the final pizza triangles and finish with a little pepper. A good salad is simple to make and is a satisfying, complete meal. This is one of my most favourite dishes. 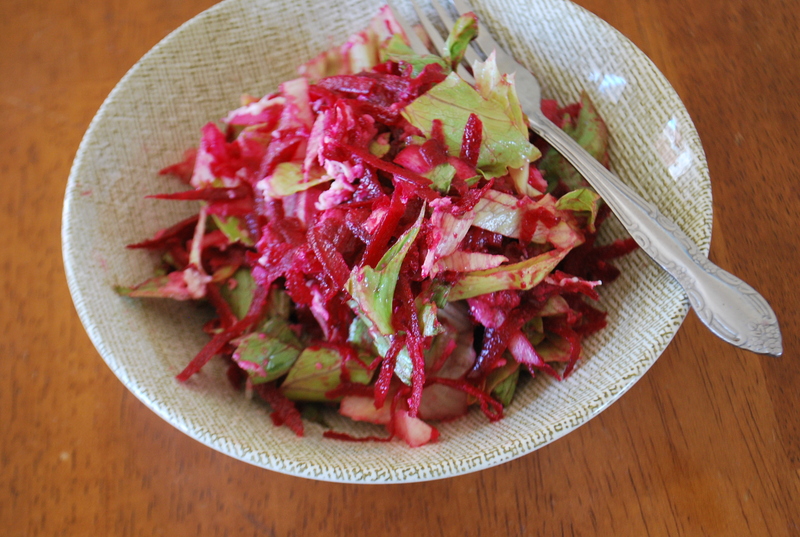 Toss grated beetroot, onion, cheezly with chopped lettuce. Drizzle with lemon juice. You know all that money you’ve been spending on expensive nutritional yeast? You know how you had to tell your provincial friends you made cheesy sauce out of weird ingredients that they can’t source in their town? BECAUSE YOU CAN MAKE CHEESY SAUCE… with Marmite. Melt margarine on the stove. Stir in cornflour until there are no lumps. Slowly stir in soy milk. Simmer until thickened. Stir in mustard, Marmite, sugar, and salt. Thin to desired consistency with soy milk. Great in lasagna, on pizza, nachos, mac ‘n’ cheese, in burgers or on wedges. 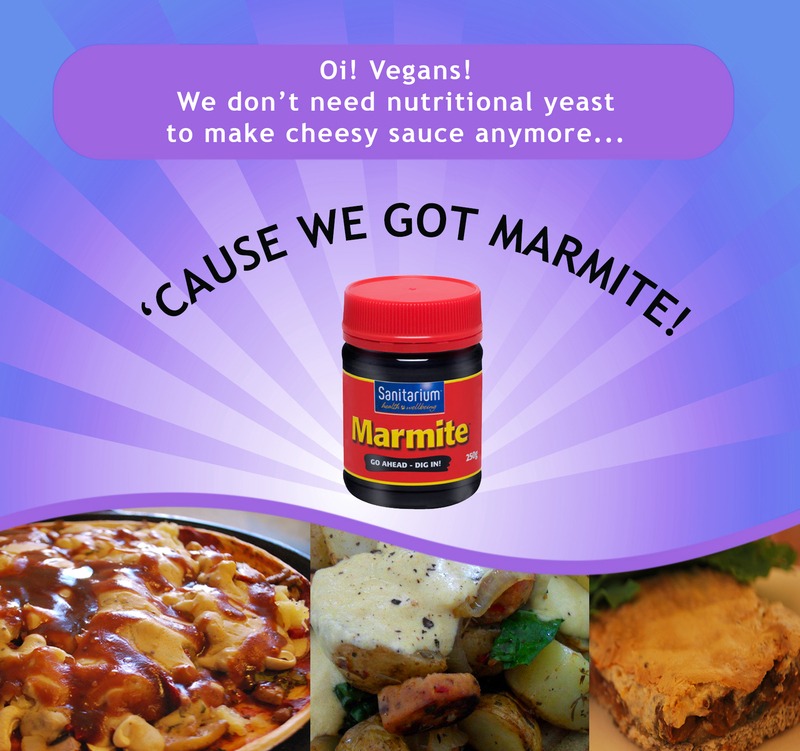 Welcome back, Marmite! We missed you! And no, we ain’t getting paid for this… (please pay us). I don’t have quantities, you’ll just have to wing it! Fry mushrooms in oil and garlic and set aside. Boil green beans and carrots together, drain and set aside. Fry onions in oil until transparent, toss in breadcrumbs, set aside. Make cheesy sauce using this quick recipe. Blend green beans, carrots and mushrooms with cheesy sauce. 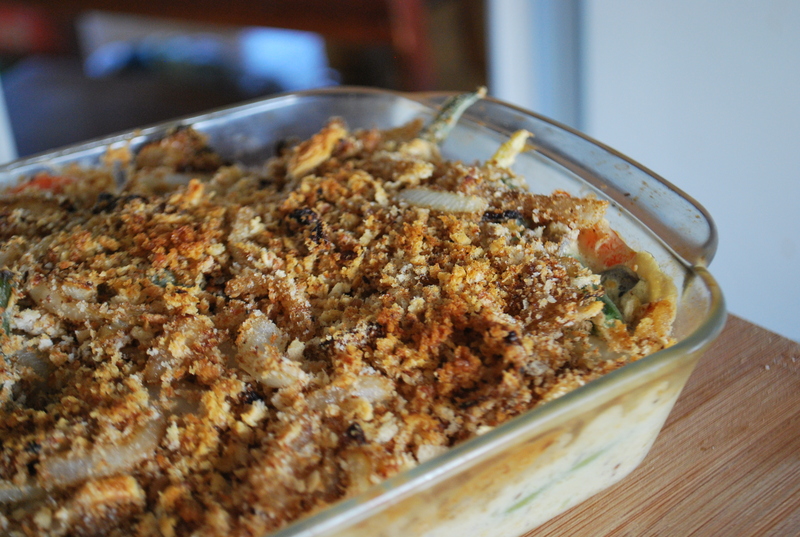 Put those vegetables into a baking dish and top with crumbed onions. This is what we use all the time around here. 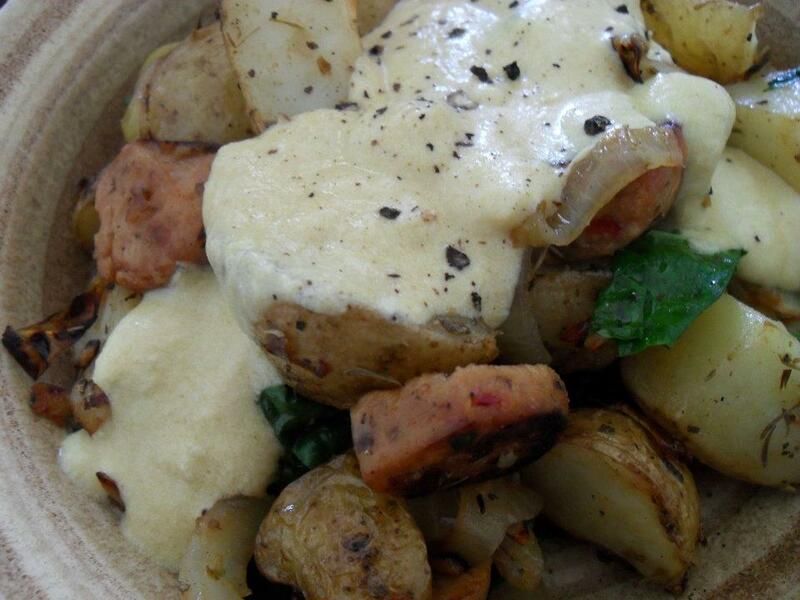 It’s simply a white sauce made with vegan ingredients and flavoured to be deliciously cheesy. As a lasagne layer, in quiche, as a pizza or nacho topping, in macaroni and cheese, on mousetraps, as pasta sauce, on fried or roasted vegetables, in pasta-bakes, on cauliflower and more. Melt margarine over stove, blend in cornstarch. 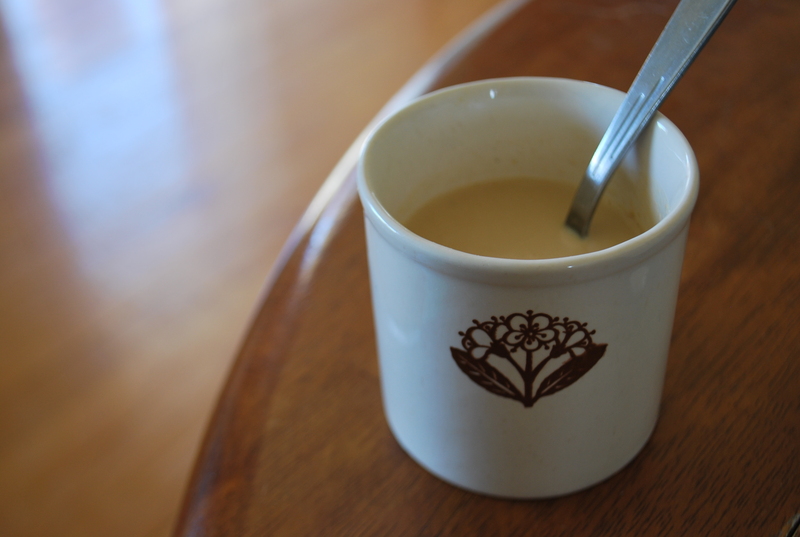 Slowly blend in soy milk over heat and stir to avoid lumps. Add salt, mustard and savoury yeast, and stir over heat until thick. Taste. Add more salt, yeast or mustard if desired. If a thinner sauce is required add more soy milk until you achieve the desired consistency.